Last week turned out to be a little rougher than I expected. I changed internet providers on Wednesday, the tech came out and, in theory, hooked everything up. To his credit he did make the change at the main box correctly. It took six days for another technician to make it out to take a look. Took him less than 10 minutes to get it working again. I also ended up helping a friend get projects done around their house to get it ready to sell, hopefully this Friday. That kept me away from my hobbies for the rest of the week. 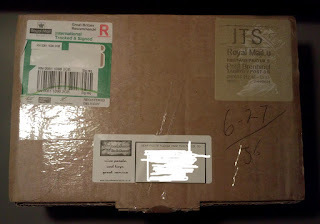 Of course I could have had the Hasslefree box if I had been in on Saturday, instead I had to go to the post office and pick it up today. This box contain my selections of minis from my $200 gift certificate for winning the Best Hasslefree entry at ReaperCon. I'm looking forward to sitting down and working on some of these. I will need to finish off that TD Company first though. 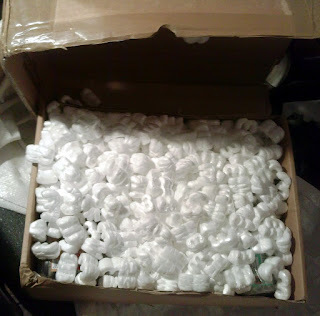 Now, on to the box opening! Okay I admit it, there was candy in there, that disappeared pretty quick. 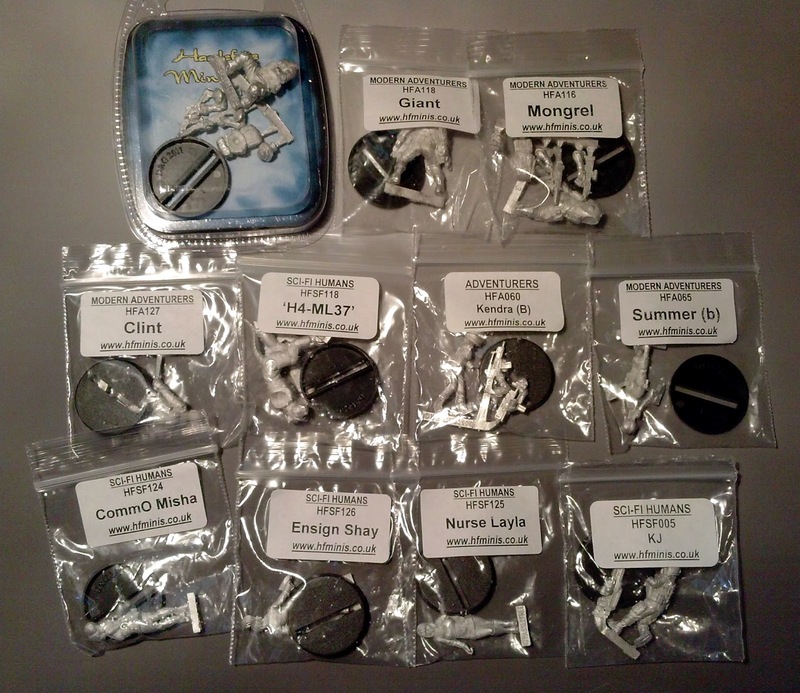 The first 15 minis, mostly sci/fi military adventurer types, including the Not-Scooby Gang. Looking forward to painting this one. 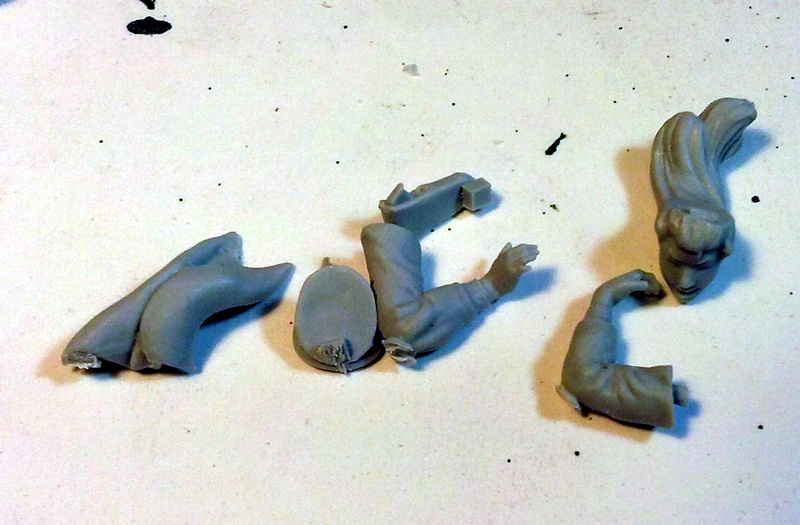 After fighting with my airbrush a good portion of the other night, I finally found the problem and corrected that. A cooperative airbrush is so much easier to work with. 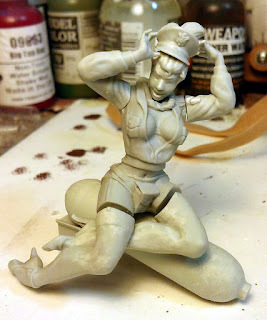 Tonight I added the Ammo Dark Olive Base and followed that up with the Ammo Light Olive Base. 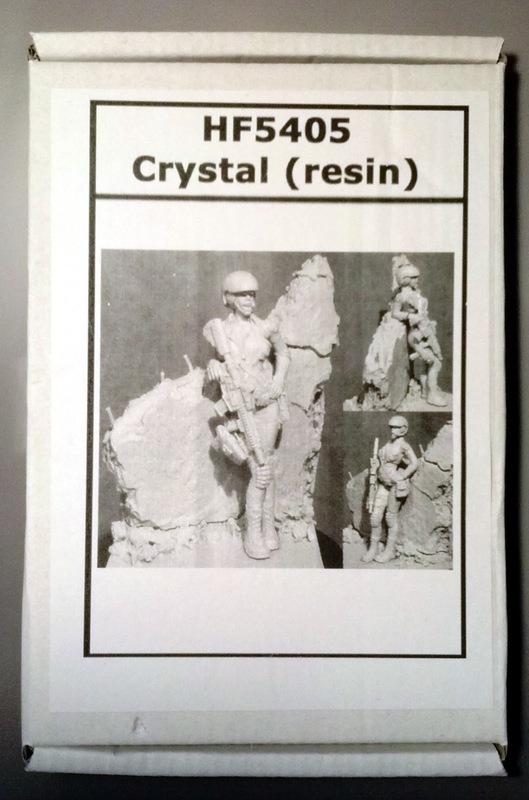 There is an opportunity for a color in between those but I'm following the book and it skips that colors, probably a good idea when working in 15mm. 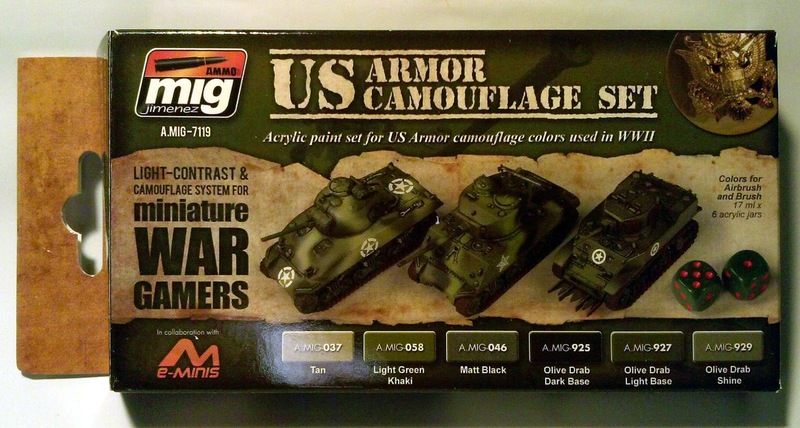 I change the angle of the airbrush between the two colors, shooting from a lower angle with the Dark Olive and a higher angle with the Light Olive in theory this will give a dark to light transition as your eye moves up the vehicle, we will see. 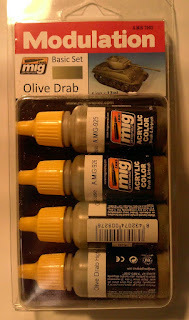 I'm may go ahead and use one more lighter shade of olive to provide some edge high lighting (yes, going rogue). 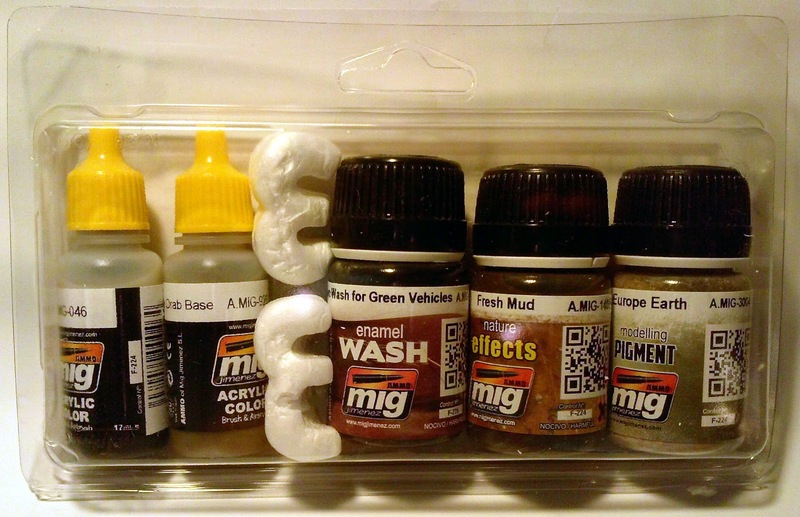 So far I'm very impressed with the Ammo acrylic paints, they mix well in the bottle, and going on nice and smooth. I haven't had to add any thinner to the colors I have used so far. After the highlight I will need to add the decals and I'm up on the air on this one. The decals provided by Battlefront really just include stars and none of the other decals that I like to use. That would delay everything though as I would have to order them and I don't really want to stop now that I'm on a roll. I guess I'll dwell on that a bit. I didn't get much done on Sunday except get the jeeps assembled, after that I went out to help a friend cut and lay tile in a bathroom. Or rather I cut and layed the tile and they watched! Today I made a bit more progress. I mounted the passengers and drivers on blocks of wood to prime them and the rest I just set on the lazy susan in my airbrush booth. I'll probably go ahead and paint them right on these blocks as well. Although some of them are a bit closer together than I would like. I used Vallejo's Grey airbrush primer and layed on a nice even coat. I let that dry, something I can get away with here, with the first color from the example in the Painting Wargame Tanks book. 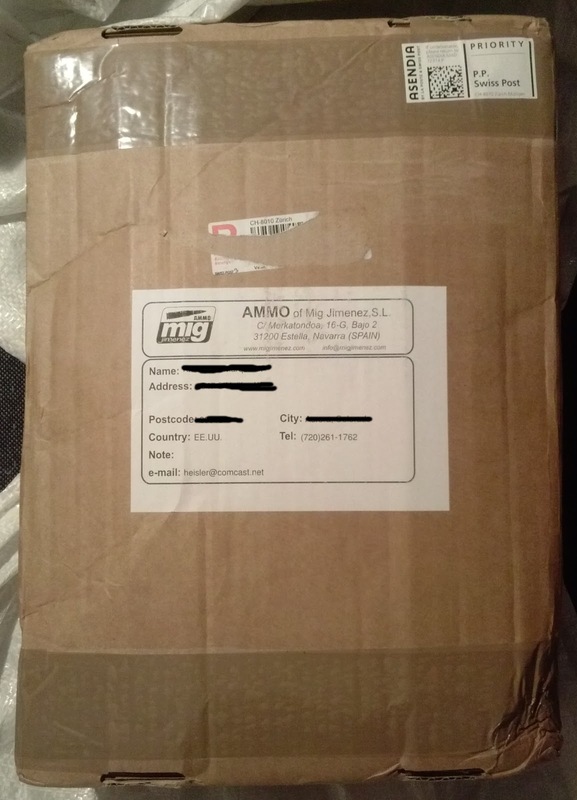 In this case matt black (A.MIG-046) from Ammo. 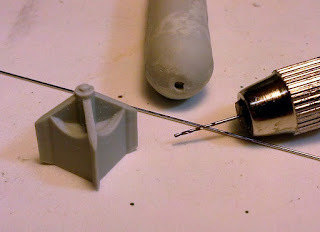 I gave it a couple of good shakes (it has its own agitator) and was able to pour straight into the cup of my airbrush. 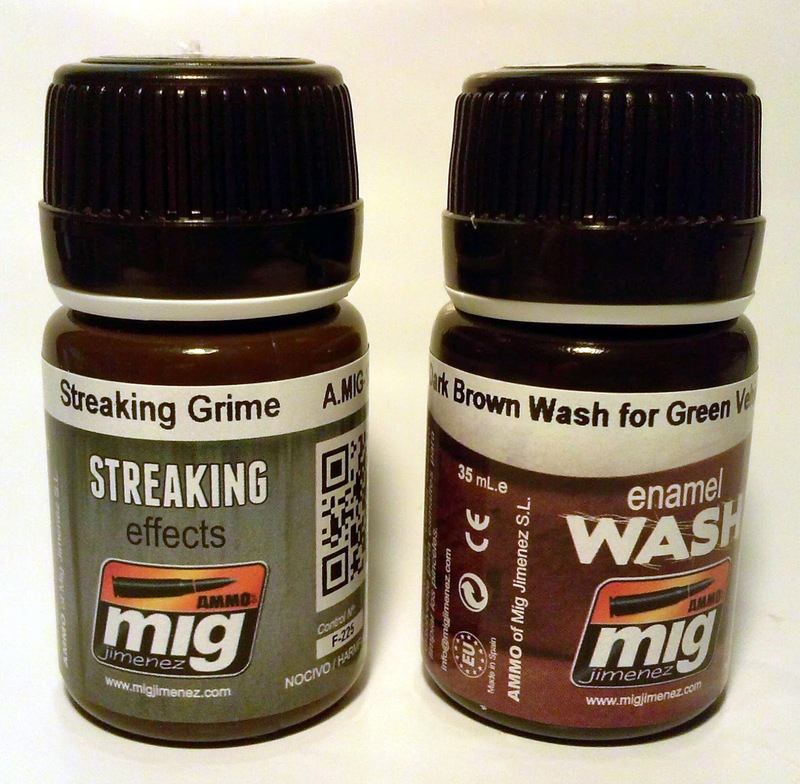 This stuff was ready for my airbrush straight out of the bottle and gave a nice smooth layer. The black gave excellent coverage, but that's not usually an issue. I'm letting everything set tonight and I hope to have time to lay the next color on tomorrow (maybe two). 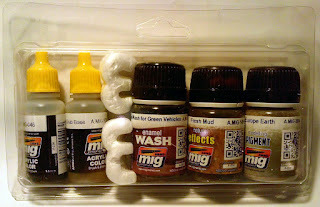 I decided to mount everything on bottle caps to make them easier to handle. I also mounted the turrets separately from the hull. 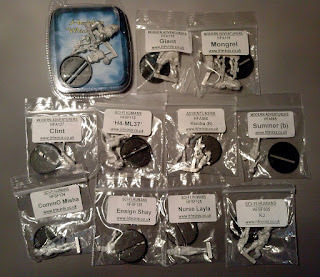 The CMPA is currently meeting on the third Saturday of the month at Total Escape Games so I packed up my painting bag and head north. I was a bit concerned when I got to the store and there was a line outside. I didn't know it was free RPG day. Fortunately I didn't have to wait in line to get in and was able to go straight in and setup. From our perspective the RPG players are our crowd, they are the group most likely to be considering getting into painting as they have already been introduced to miniatures, either through friends that paint, or the pre-painted miniatures produced by WoTC and Reaper. We gave out some of the club business cards and talked to a number of people who wandered by and I think we will be seeing some of them next month. 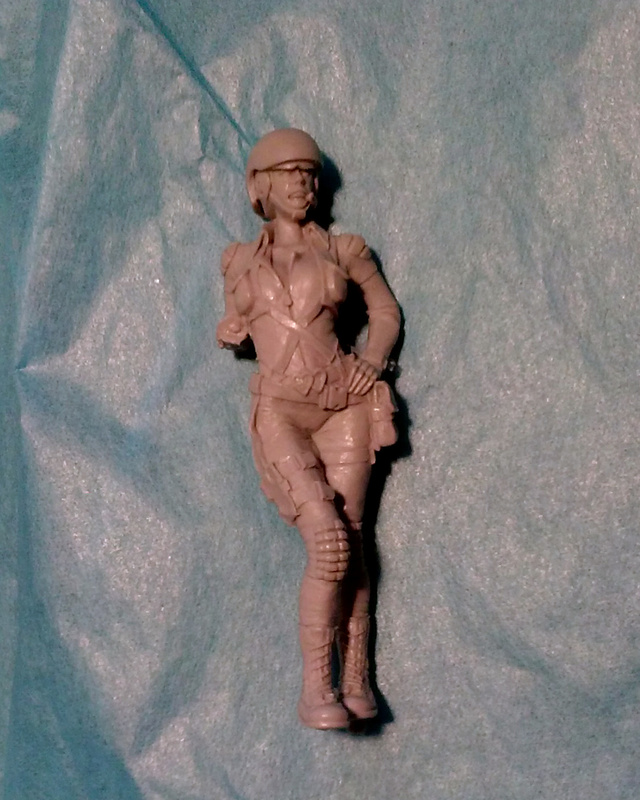 At the store I worked on the flesh tones for 54mm Death from Above piece from Hanger 18. 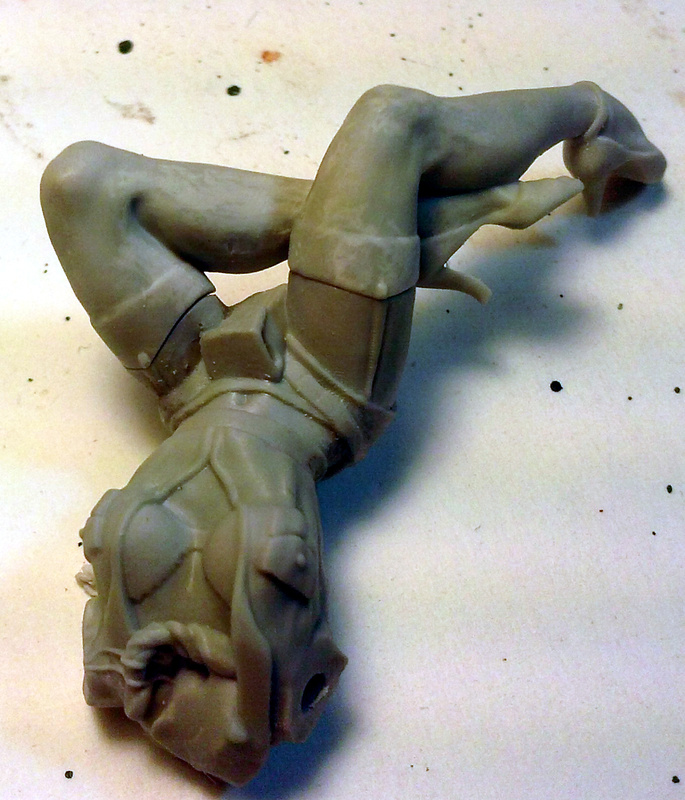 After about 3 hours I was totally unsatisfied with the results and I'm going to strip her back down to the resin. I did manage to take a picture before I got started though. 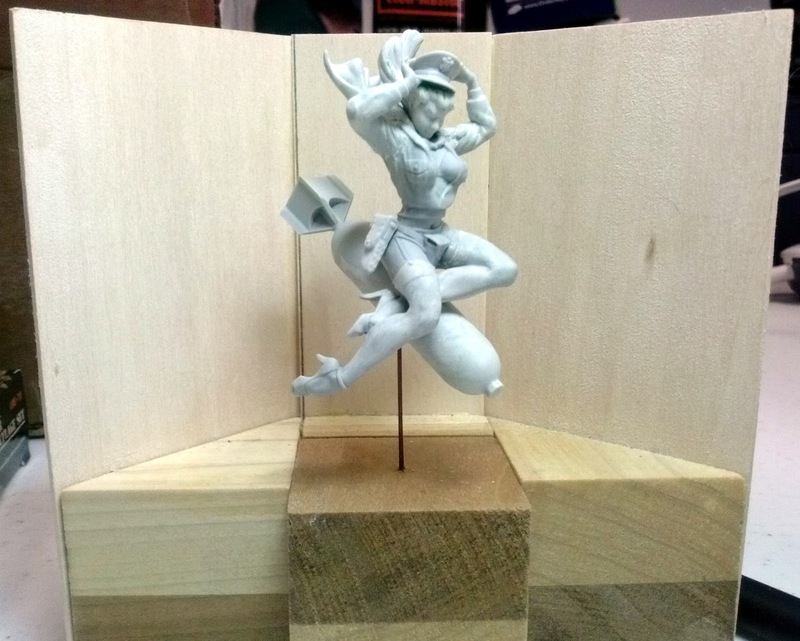 She will be displayed on one of my three sided displays although not the one she is pictured in. I'll have to build one slightly larger to really accommodate her. 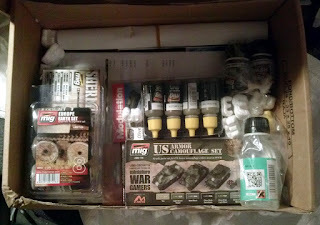 I have decided that my distraction work will be done in 15mm WWII so I can try out the techniques in the "Painting Wargame Tanks" books that I received from Ammo on Friday. 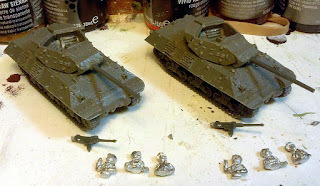 Rather than just pull out some tanks I decided that I would start work on my US Army and just to be different I thought it would be fun to work on a Tank Destroyer Company. 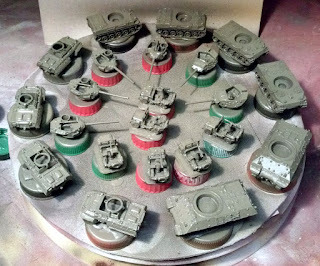 I'm moving away from Flames of War though, I just find way to many things that irritate me about that game, so I'll be basing these for Test of Battle which is the 4th Edition of Command Decision. That means that I'm going to be missing some vehicles that are included in the Command Decision version of that organization that aren't included in the FOW organization. 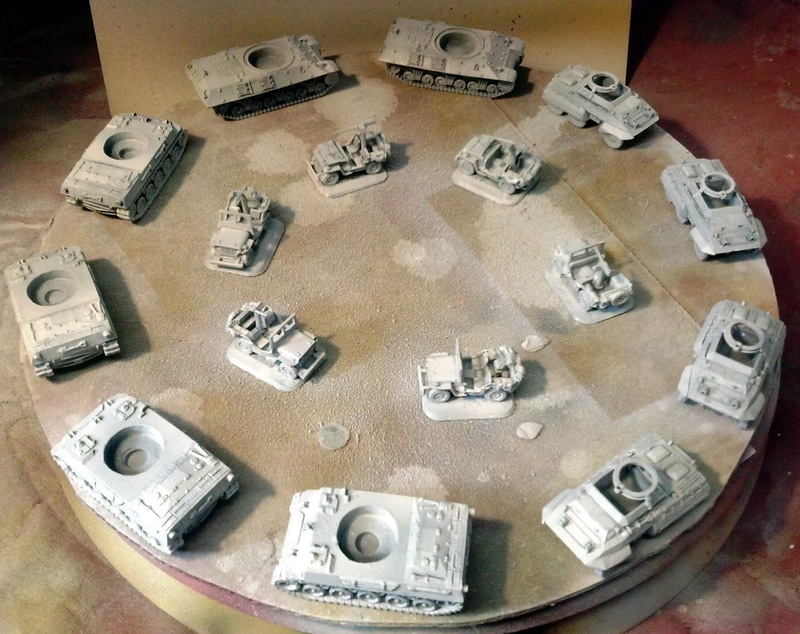 Working from the second edition Armies of the World the TD Battalion is broken into an HQ Company, a Recon Company and three Tank Destroyer (SP) Companies. 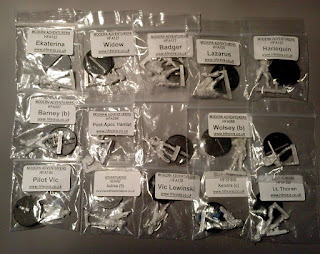 I have most of the components for the Tank Destroyer Company. I'm missing M8 (which I don't think had been released at the time I was accumulating vehicles for this). I'm also missing an M10 as I only have 2. 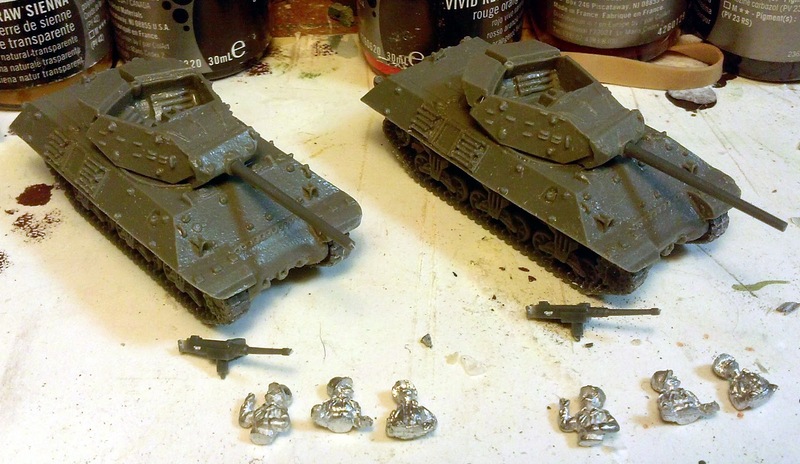 If I wanted to build the full battalion I would use either M10s or M18s they weren't mixed within the battalion as far as I know. 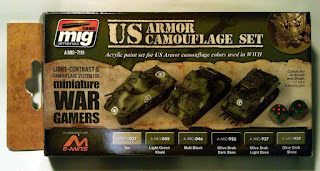 I'm modeling the 4th Armored Division so I'll have to figure out which vehicles they had in their TD battalion. 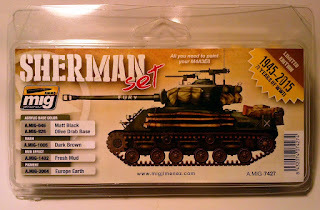 But in the meantime I think I'll go ahead and try and acquire one more M10, 3 M8s and a Lt Truck to round out the TD Companies and the Recon Company. I was able to get most of the assembly done last night. 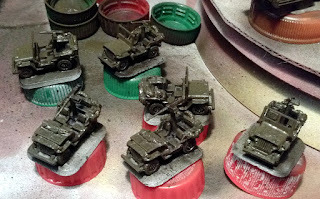 I still need to do the jeeps, which appear to be the most complicated models of the bunch, and then I'll get them primed. After that I can move on to seeing how well the book is actually written. Elements of the Tank Destroyer and Recon Companies washed, scrubbed, dried and ready for assembly. Parts for the M18 Hellcats. 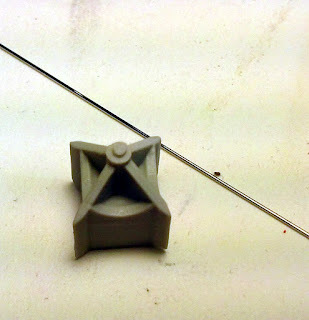 I was missing a piece, but was able to form a replacement for it from wire. Its the odd bar that extends across the top of the hull from front to back over the gun. I must have got these in transition from one resin to another. I think the darker hulls are older. You can see the replacement wire on the turret of the light grey resin M18. 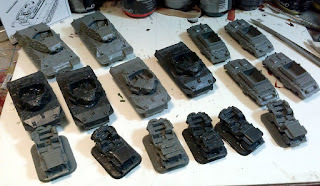 M10 Wolverines ready to go. At the time these were the new versions with the plastic tracks and gun barrels. Hopefully the current version will still match in size. Battlefront has a nasty habit of changing the size of the models when they make a new version. M20s ready to go. 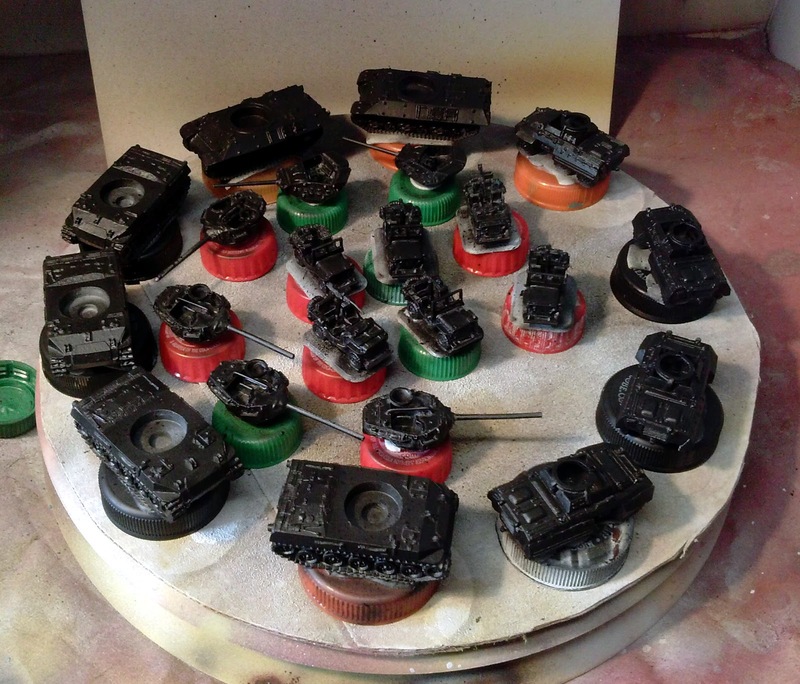 I add the crews and MGs after the bulk of the paint work is finished. Its easier to paint the crews outside of the vehicle and it avoids breaking the MGs. It was late and I called a halt to assembly when I got to the jeeps. I'm not sure why the smallest vehicle seems to have the most parts but I was to tired to finish them last night. They will be first on the list to do today. I needed to do something a little different so I was thinking about starting in on my US Army force for FOW, not that I actually play FOW but all those vehicles will certainly work for other WWII games. 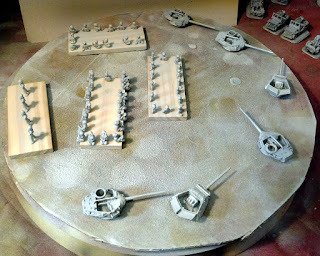 I'm leaning towards playing Command Decision, and Spearhead again with these. But, I decided I wanted to go a few extra steps beyond my regular table top work and I knew that Mig Jimenez had started up yet another company. I thought I would go ahead and try out these products and see if they were really different from those produced by his prior companies; MiG and AK Interactive. 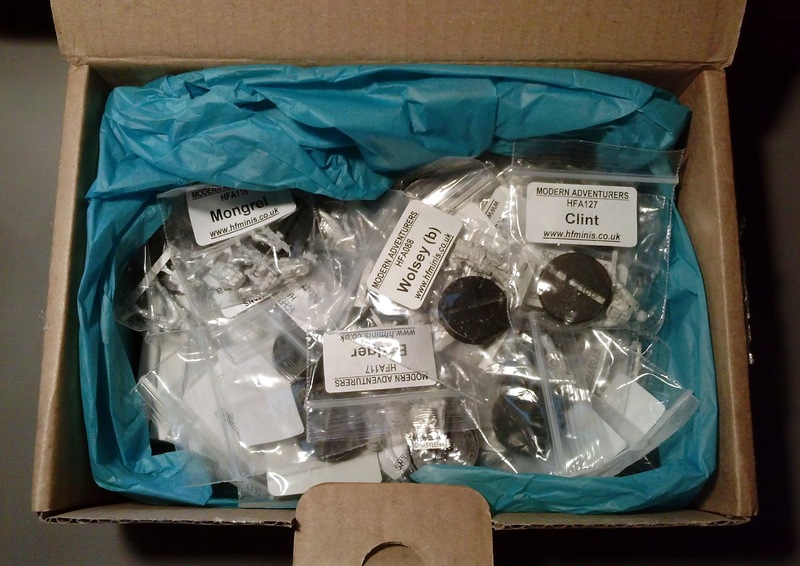 I should have paid a bit more attention when I was ordering though and I have a couple of duplicates because I was buying sets and then didn't double check to see what was in each one. 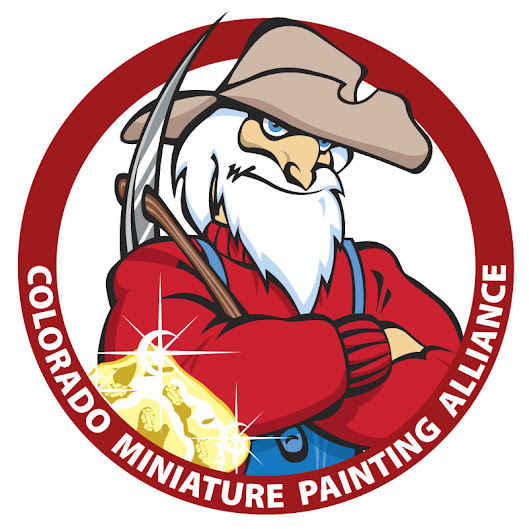 I started off with their combo offer which features one of their books and a paint set that is geared towards that book. In this case I picked up the "Modulation Book" along with the Olive Drab Modulation set. I have tried this technique a couple of times without much success. I was hoping that this book my really show me what I was doing wrong. 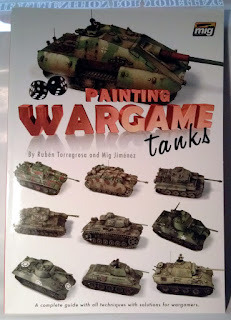 The second book was "Painting Wargame Tanks" along with the US Armor Set. 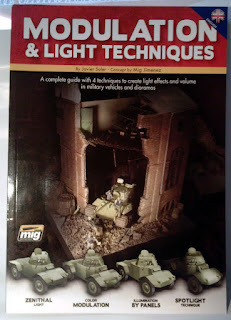 I was curious to see what kind of advanced techniques they would try and show off in this book. I'm looking forward to reading it. I picked up some other miscellaneous items to go along with these and that's where I managed to double up on some items. 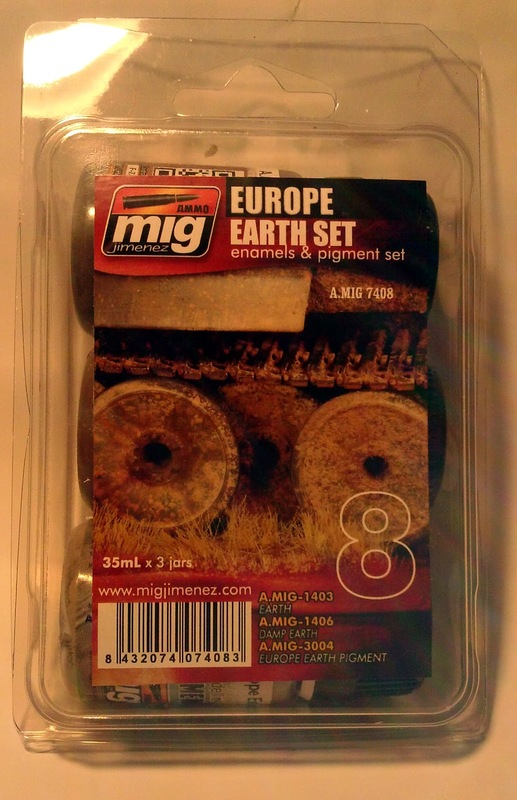 The Europe Earth Set is a set of three pigments, the Fury Sherman set that contains paint, pigments and washes, a bottle of streaking grime and a bottle of wash for green tanks (duplicate there, its in the Fury set). So I'm looking forward to some reading and trying out some new techniques. Then there is the story of the package and how it arrived, best said in pictures. 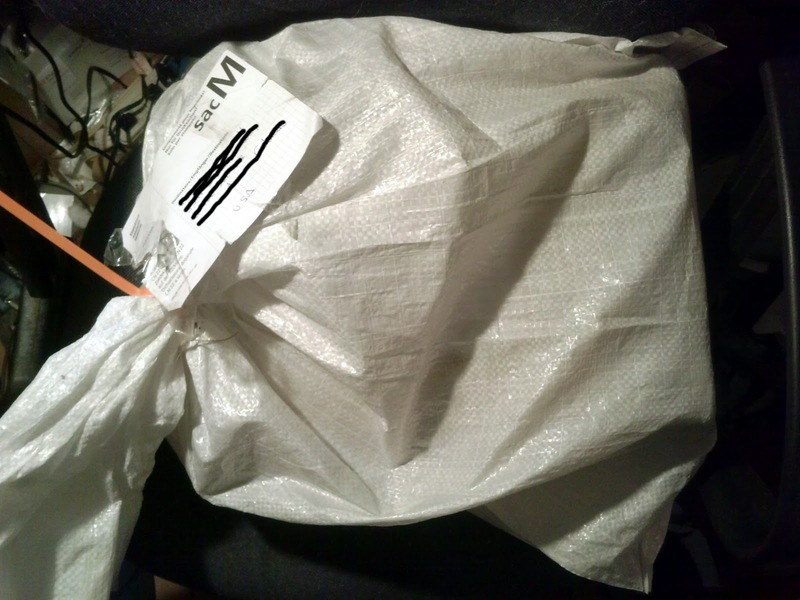 So my package arriving in a white nylon bag had me concerned about what USPS might have done to it. Well the box is a bit beat up but certainly in much better condition then I was anticipating. I had images of it broken up, spilled paint and ruined books. 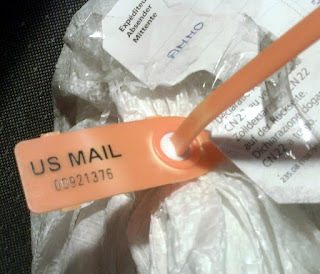 And there is my least favorite stuffing material, at least they were the anti-static kind. There we go paints and books, looking in good shape. 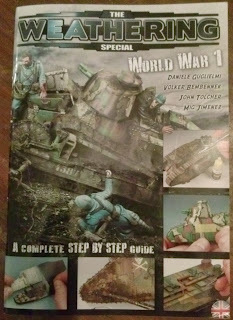 to a special edition of the weathering magazine specific to WWI. This is a product of Ammo of Mig Jimenez. And yes that is the same Mig Jimenez that started both MiG and AK Interactive. Ammo sells essentially the same products as the other two companies the difference being they have MJ now! 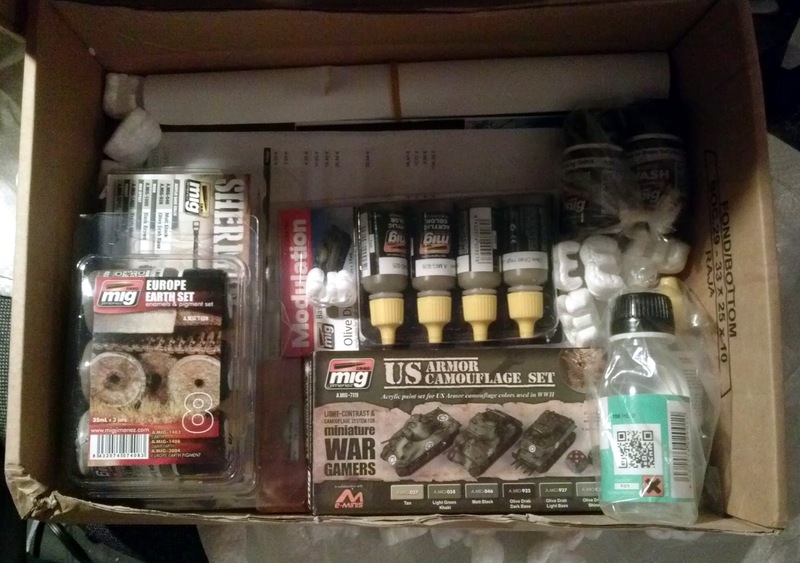 Whatever his failngs may be as a business man his modelling and painting skills are fantastic. The Weathering Magazine is a regular publication and this is their first special issue. The issue starts off with a brief history if the development of the tank and the approaches taken by each of the major combatants. I found this both useful and informative. Definitely take the time to read it. The bulk of the issue focuses on the builds of a French FT, a French St. Chamond and a Britsh Mk IV in German service. Each build features a plenty of step by step pictures and text and explores a variety of techniques. I enjoyed all three builds and I'm itching to get back to the work bench and start work on my FTs. My only really criticism is that the pictures tend to be a bit on the small side and some if the descriptions could have been more detailed. 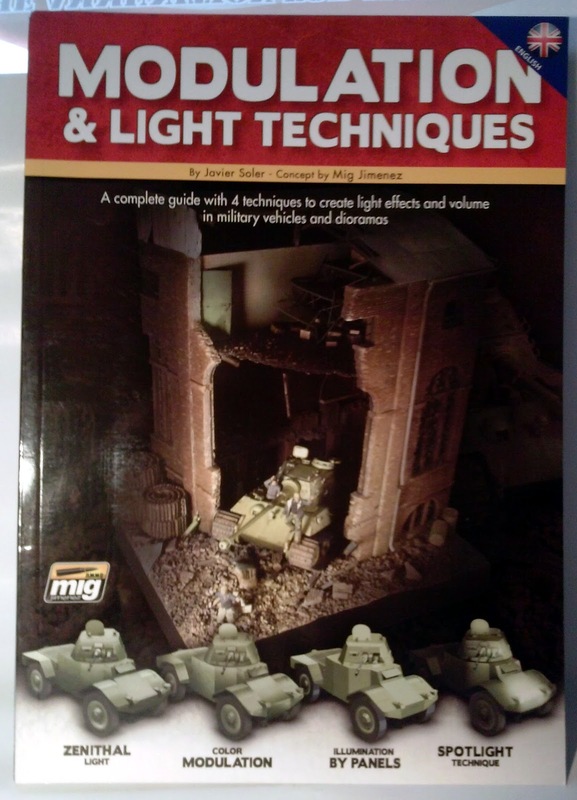 I would recommend this issue to any tank modeller. The techniques are appropriate to any period. 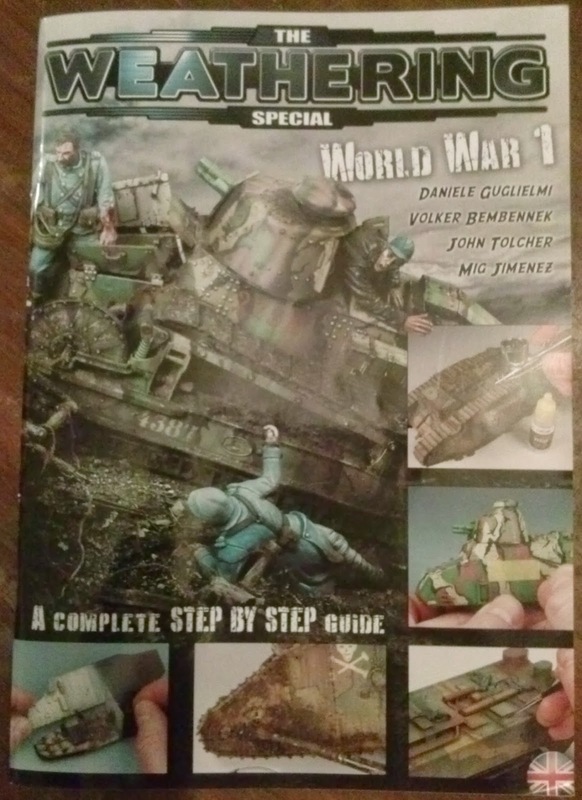 The issue also comes with a small pamphlet titled "The Great War; The First Tanks 1914-1918". This is a camouflage guide featuring the vehicles in British, French and German service. It includes color swatches as well. 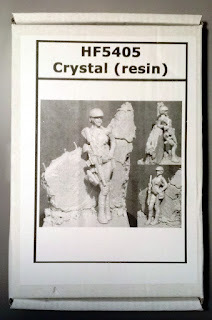 It is a handy little guide to have on the workbench. And yes, I realize the pictures are side ways. But I wrote this entire post from my phone. I'll correct them when I have computer access again. Started the assembly this evening. Overall it went very well, there are a couple of components that don't fit as well as I would like, so it wasn't a perfect assembly by any means. 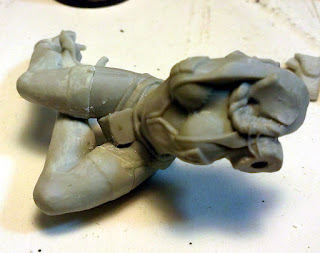 I used super glue to assemble and Vallejo Plastic Putty to fill gaps. I decided that this joint was likely to be pretty weak, there is not a lot of surface area on that pin. I pulled out my finest wire (.016) and a #77 drill bit for this one. Tail fins in place. These won't be going anywhere now. 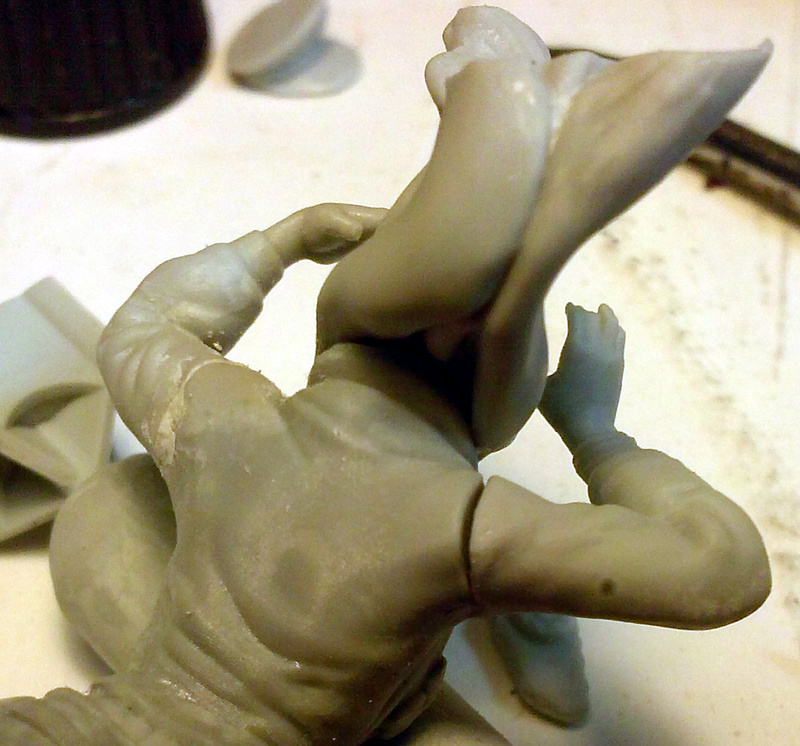 Glued on the legs, the only significant gaps are on the back of the legs. 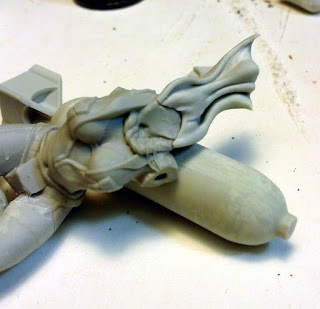 I probably don't need to bother with gap filling these as you can't see them once she is attached to the bomb. 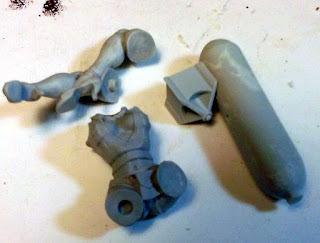 The right arm is not a good fit. Everything is in place here. I'm going to have to sculpt some hair up underneath the hat. I'll pull out the green stuff in my next session. 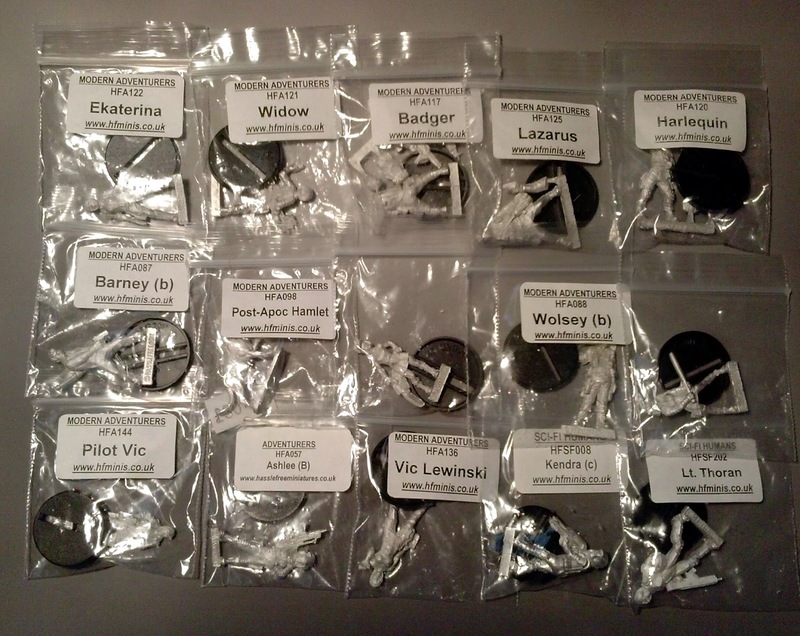 There is a 54mm Challenge going on in the Reaper forums. 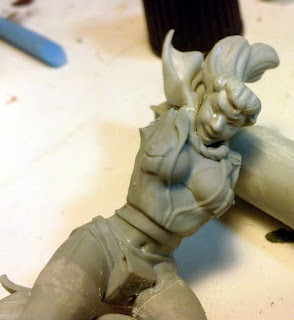 I though it would be a good time to work on one of my minis from the Hanger 18 Bawidamann kickstarter. 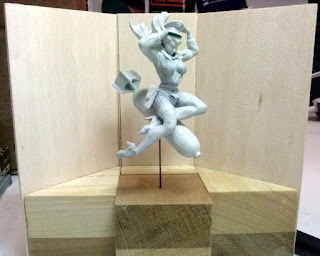 Just looking at how things go together I think the is the simplest of the three models. I pulled it out today to start the prep and do a test fit, I'm quite pleased with this one so far. 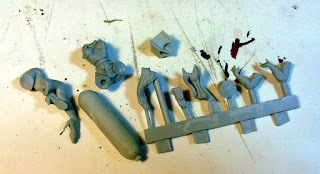 The mold lines were very light and easily removed. 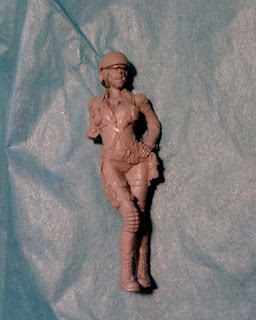 I press fit everything together and it looks like there are going to be some seams that will need a little putty work but nothing significant. 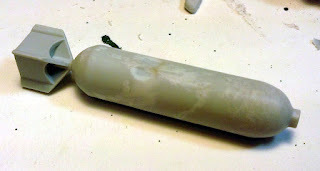 There are no bubbles or pockmarks in the resin either. I was going to put her together today but my bottle of super glue seems to have disappeared. The contents of the bubblewrap pouch minus the clear plastic flight stand. 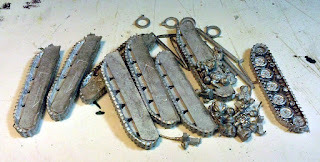 Pieces removed from the sprue. I didn't clip them to close to the sprue. I prefer to do the final clean up with a knife or a file.